Finally! Im back and i get to participate in the Mizuno Infinity Run today. As always, mind is willing but this time body was not that ready. I was conscious this time and did not push myself too much. 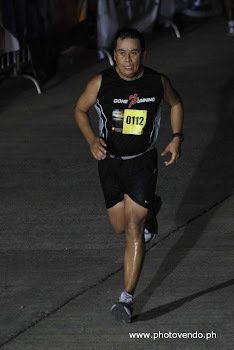 It was a good run for me, the only consolation was that i am still within my time finishing the 10k. I registered on site and thought i would run as a bandit, but luckily registration was still on. I was thinking if I will only run 5K, but decided to try 10k anyway. This time, i made sure that i am well hydrated. My buddies improved their PRs today. Congratulations! It's good to see progress in every run. With proper training and discipline, you will surely hit your goal. I believe every runner always looks forward to their next run. There's no way to go but to improve each one's performance. But for me, im yet to improve my own PR. I'll get there, one stride at a time. I was able to meet some of the takbo.ph guys, thanks to Mhel for introducing me and my buddies to the group. Was able to get photo with them. More photos with my friends.